The housing bubble in many countries across the globe is now starting to pop. Australia bubble is now deflating. NJ is in trouble they are broke and they just upped their return on their pension plan, this is going to be a disaster. If the economy is so great why do so many people have more than one job just to make ends meet. If wages were rising at the same level as of inflation people wouldn’t need to do this. Goldman says trade war can be won if the market is crashed. African nations are ready to make the switch to the yuan and not use the dollar, the say it makes no sense to use the dollar anymore since their business is with China. FBI reports Obama deployed spies to London and the spying began much early than everyone knows. Clapper admits we pushed for regime change in 80 plus countries, he says this was done for the people of the US. IG report coming out on June 11. The construction on the wall has begun. Italy takes back control, Soros out and the illegals are out, Italy first. Ukraine’s false flag operation is flopped as the truth comes out. Protest in Jordan force the PM to resign. Rebels in Syria agree to return to their normal lives and turn in their weapons. Turkey and the US come to an agreement in Manbij. Iranian advisors on their way to Damascus for discussions. Q is back and drops the first crumb. Black out was necessary, dark to light, boom, boom, boom. Please check Newzsentinel.com†for the latest news on the economic collapse. The Sentinel Alerts are updated throughout the day. If you haven’t already, go to†“The People”†and join the community of people who are helping each through the economic collapse. 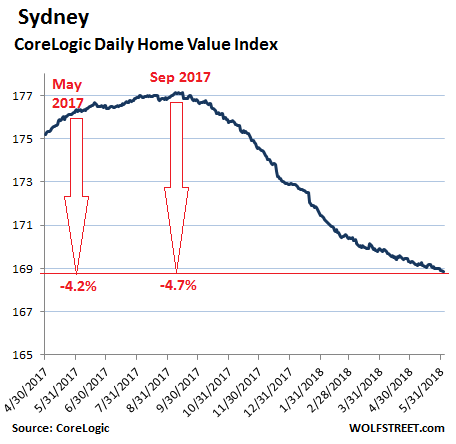 In Sydney, home prices had jumped over 80% from the end of 2009 through the peak in September last year, after having dipped only 4.6% during the Global Financial Crisis, turning the city into one of the hottest housing bubbles in the world. Melbourne is a few months behind Sydney. 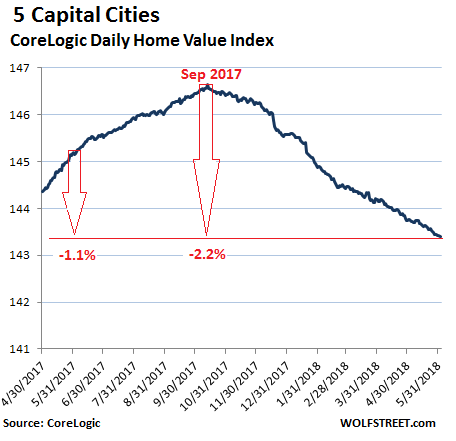 Home prices peaked in December 2017 and have since declined 1.7%, but are still remain up 2.2% from a year ago, with house prices up 1.5% condo prices flat (-0.1%). 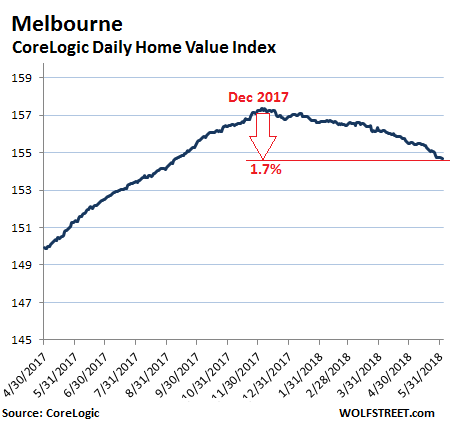 In the five capital cities in aggregate, home prices have dropped 1.1% from a year ago – the first annual decline since October 2012, according to CoreLogic. The index has now declined month-to-month for eight months in a row for a total of 2.2% from the peak in September last year. The negative headline growth rate is a symptom of weakening housing conditions across the capital cities, led by Melbourne and Sydney where previously, capital gains were nation-leading. Sydney and Melbourne comprise approximately 60% of Australia’s housing market by value, and 40% by number, so the performance of these two cities has a larger effect on the headline market performance. In short, if the state doesn’t quit non-essential spending or the state Legislature doesn’t allow the Murphy administration to shuffle spending from one part of the budget to another, they risk ending next month’s fiscal end-of-year in the red, according to the New Jersey Treasury Department. “It is essential that we freeze all discretionary spending to ensure we can support the crucial functions that keep the state operating — everything from caseworkers for children in foster care to the operation of our developmental centers to the safety and protection provided by the State Police,” she said. New Jersey’s fiscal situation is so dire that new Governor Phil Murphy has proposed taxing online-room booking, ride-sharing, marijuana, e-cigarettes and Internet transactions along with raising taxes on millionaires and retail sales to fund a record $37.4 billion budget that would boost spending on schools, pensions and mass transit. If The Economy Is So Great, Why Are 78 Million Americans Hustling For Dimes? Even though the official unemployment rate has dropped to a 18-year low of 3.8%, the economy is still broken for a great number of Americans who are living a precarious existence – nearly invisible and economically marginalized. For millions of Americans, the security and income of a steady 9-to-5 job is as far out of reach as it was during the worst of the Great Recession. Some, of course, have simply given up on finding any job, discouraged about their employment prospects after so many years out of work. Many others have resorted to scrambling for a buck here and a buck there, cobbling together a patchwork of irregular hours and side hustles. This new army of contingent “workers” don’t seem to fit any of the old classifications. They aren’t employees exactly, nor do they act much like entrepreneurs. How widespread is this phenomenon? Some say these so-called “alternative work arrangements” are pervasive, encompassing tens of millions of workers. The Federal Reserve has just published a study that sheds some light on this hidden part of the economy. The Survey of Household Economics and Decisionmaking delves into how people feel about their economic lives and why they make the decisions they do. The SHED found that about 31% of adults participate in what the Fed called “the gig economy” – work done outside of regular employment structures. That looks huge — about 78 million people. However, most of these people are working five hours a month or less on their side hustles, and the kinds of activities this survey considers to be “gigs” is far broader than what other researchers consider, including selling goods and services online or in real life, or picking up a few hours of babysitting. About 78 million Americans earn some extra money with a hustle on the side. The Fed might think that 3.8% unemployment is the “Mission Accomplished” signal. Millions of people scrambling for dimes disagree. US Factory Orders continue their flip-flopping performance with a 0.8% tumble in April – worse than expected – after an upwardly revised 1.7% rise in March. for Trump’s trade negotiations to be successful, and for US trade partners to take a flip-flopping Trump credibly, the market has to crash. Incidentally, this makes sense when one considers that when Trump officially launched the trade war with China in early April, the president explicitly warned that stocks “may take a hit“, and told investors to prepare for “pain” in the market, a statement which promptly became a self-fulfilling prophecy and sent the market sharply lower. The world’s push towards de-dollarization continues to accelerate. officials from Africa are seen calling for more yuanification of the massive continent’s economies. There has been a general consensus among some eastern and southern African countries that there should be more usage of the Chinese yuan in the region because of China’s growing influence in business and trade, a financial expert said Thursday. The forum was attended by deputy central bank governors and deputy permanent secretaries of finance from 14 countries that fall under MEFMI. “The general conclusion is that we should use the yuan more because its time has come. We are doing more business (with China) so it’s natural that we use the currency of the country with which we are trading. “Just the way we have been using the (U.S.) dollar and the Euro, we want to use the Chinese currency more in our transactions because it is to our benefit,” he said. He said use of the yuan could protect the region from currency volatilities. The use of the yuan also came in handy because China was giving loans to the region and other African countries. “One of the issues we discussed though was that sometimes if you have borrowed from China they want to bill you in U.S. dollars. Now we are saying our government must start discussing with Chinese enterprises (and) government so that we’re billed in yuan and then we can pay in yuan. Because there is no point if we start keeping our reserves in yuan but we’re billed in dollars. It is no good,” he said. A series of newly released FBI text messages reveals that the Obama White House deployed FBI agents to Britain early in 2016 to begin the Trump surveillance operation. According to a report the FBI/DOJ began their illegal surveillance operation of the Trump Campaign under direct orders of former President Barack Obama. DOJ/FBI sting and Trump campaign aides. A series of text messages recovered by DOJ Inspector General Michael Horowitz between FBI lawyer Lisa Page and special agent Peter Strzok reveal political pressure around the same time as the Trump-Russia probe officially opened. Former head of US Intelligence James Clapper just admitted that the United States was simply looking out for citizens of various countries “when we tried to manipulate or influence elections or even overturned governments,” a statement directly at odds with the moral high ground claimed by President Obama and other US officials on the topic of Russian election meddling. The new wall is a bollard-style design measuring 18 to 30 feet tall and includes “anti-climbing plates” welded on the upper half of the structure. The Texas-based construction company, SLSCO, was recently awarded the $147 million construction contract to complete the 14-mile stretch. The money to build the new wall comes from the omnibus spending bill that Trump signed in March. The piece of legislation included a $1.6 billion down payment for a border wall that would extend across the nation’s southern border. Italy’s anti-immigrant League party, which on Friday formed a populist movement in coalition with the 5-Star party, and whose leader Matteo Salvini stepped into his new job as Deputy Prime Minister and Minister of the Interior on Friday, pledging to deport hundreds of thousands of illegal immigrants. Poland and the Czech Republic have also notably resisted Soros’s policies. Ukrainian authorities announced last Tuesday that Babachenko had been assassinated after returning home from the store. On Wednesday, Babachenko appeared at a press conference with Ukrainian authorities who said that the faked assassination was an elaborate sting to bust an actual hit planned by Russia. In Jordan, several protestors have been been injured after a third consecutive night of demonstrations against austerity measures proposed by Prime Minister Hani al Mulki. The crowds called on King Abdullah to sack his Prime Minister over the plan – which has IMF support but comes on the back of a sales tax hike and a cut in bread subsidies. Jordanian Prime Minister Hani Mulki has officially submitted his resignation , Mulki’s resignation was meant to defuse the anger over the economic policies that sparked the large protests across the country. Russia’s plans to supply S-400 Triumf air defense systems to Qatar will not be affected by the opposition of Saudi Arabia, Russian senior lawmaker Aleksei Kondratyev told Sputnik. In terms of world’s proven reserves, Iran is #4 in oil and #2 in natural gas. Thus, a free Iran will endanger Saudi Arabia’s role as the leading oil producer. To give some historical context, the only reason that Saudis are so rich now is that Iran has been virtually isolated by crippling US sanctions since 1979. For decades before that, Iran was #1 in oil production and refining, but everything changed when Saudis colluded with international financiers to create the oil-for-dollar (“petrodollar”) scheme in the 1970s during the dollar crisis. A resurgent Iran will also mean competition to US oil and shale companies which have been ramping up production since 2011 (when Libya was destroyed!). As part of the deal, the rebels were supposed to hand over their weapons and pledge not to carry out any act that could harm the security inside the country. So those who had their legal status settled handed over automatic rifles, RPG launchers, sniper rifles and various munitions to the authorities. Breaking: Iranian advisers went to Syria at the request of Damascus – military spox. The Spokesperson for the Iranian Armed Forces, Brigadier General Massoud Jazayeri, told reporters on Sunday that Iran’s military advisers went to Syria at the request of the government in Damascus. You know, like giving our Uranium to the Russians? Now you know why Mueller is now secretly cooperating with Sessions. Mueller delivered the Uranium sample to Russia.